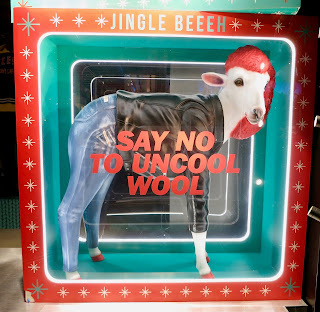 'Saying no to uncool wool' is the strapline for Diesel this Christmas (as in naff Christmas sweaters) although we did have to check out their website to clarify this as on initial viewing we did rather interpret this scheme - at this irreverent brand - as highlighting their kinkier side if you get our drift? 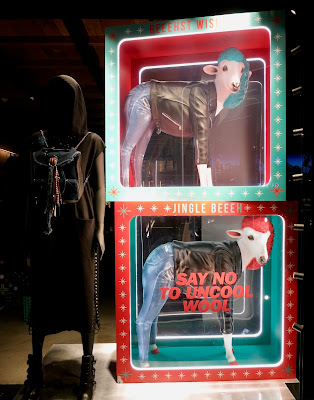 (Particularly as the mannequins in their Black finish do look slightly sinister). Cu'mon you did too, right? 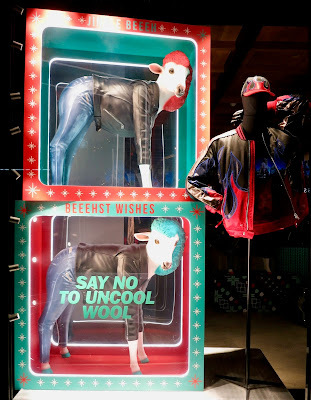 Life-sized sheep in a box wearing clothing, for the person in your life that has everything else? This cheeky little scheme did have the Arab community around Knightsbridge where we captured this scheme looking rather puzzled although great fun it is too.